A wonderful moment I experienced in the Kgalagadi transfrontier park that cross borders South Africa and Botswana on 20 November 2015. 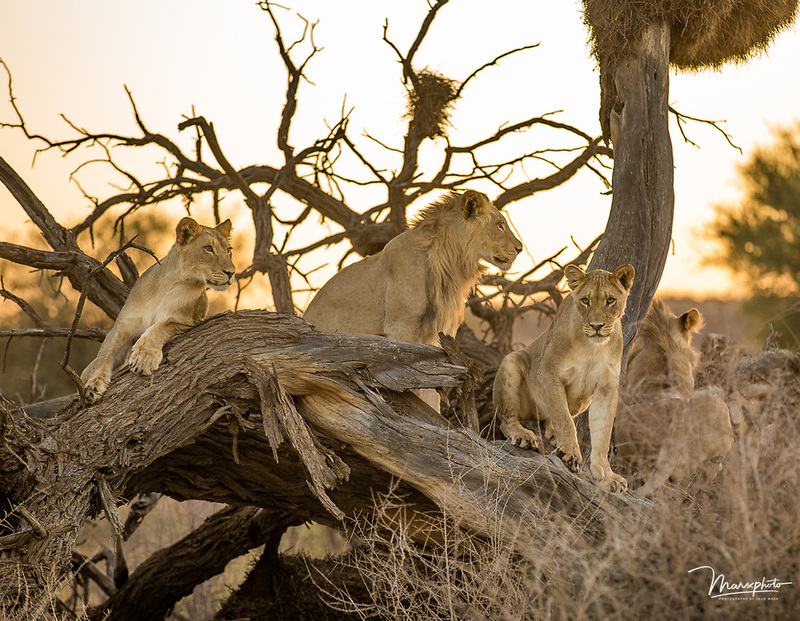 I captured a gathering of a small pride of lions very early in the morning with the sunrise in the background as the lions rested on an old tree. The way they positioned themselves made for a beautiful composition. The tree added great texture and diagonal angles in the frame. Post processing in Adobe Lightroom 6 included cropping, dust removal. Profile correction was also done. I corrected the white and black values to portrai the natural, original scene. Contrast was increased with 45%. Highlights decreased by 50% since I was shooting into the sunrise. Shadows increased by 30%. Global sharpening by 10%. A Selection of African land predators from countries including Kenya, Botswana, Namibia and South Africa.